Equinox...The Journey into the Supernatural isn't the best film out there, but it is a strong film with some great looking, homebrewed special effects that were created with love and for the craft. 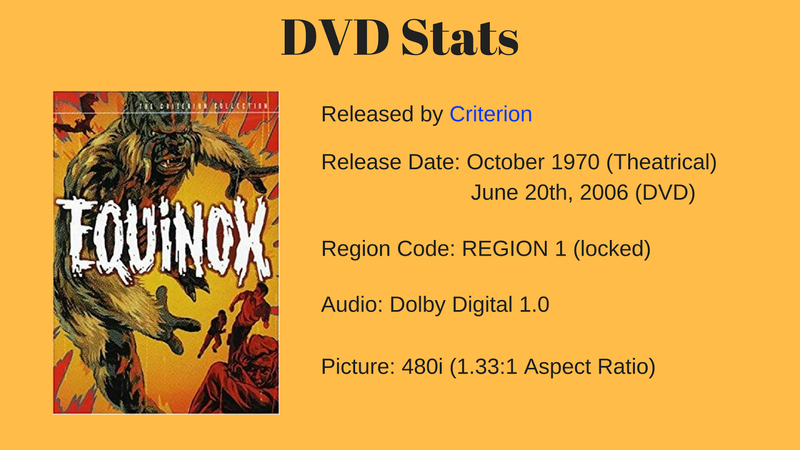 Equinox (1970) is a film re edited and added to without very much care nor talent. It is a fairly hollow experience. Ackerman is the founder of Famous Monsters of Filmland as well as being the person who coined the term "Sci-Fi". Ackerman gives us a brief history of his magazine and how one of the most famous features was the one where some of the secrets from the experts on to do some big Hollywood effects in your own house. He also talks about his relationship with the filmmakers of Equinox...The Journey into the Supernatural and gave them advice whenever they needed it. He finishes up with a discussion on the two different versions of the film. While he does give his preference of one version over the other, he comes off colder when talking about the 1970 version as opposed to the 1967 version. Commentary by Writer/Director Jack Woods and Producer Jack H. Harris on the 1970 Version. them proper. The outtakes are soundless and a mildly interesting. interesting because it gives us a good look at how forced perspective is handled. Muren starts out by talking about his love for special effects work and his love for Forrest J. Ackerman. 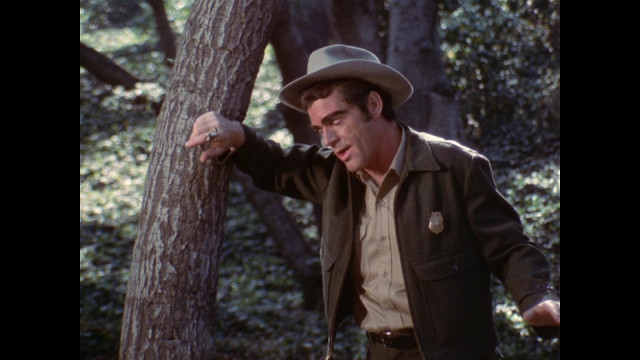 After making the film, Muren and company found that no one wanted to distribute the film un Jack H. Harris came along. He finishes out by talking about how he misses stop-motion animation, but can do without the imagery. Frank Bonner, Barbara Hewitt, and James Duron talk about both versions of the film, including the fact that it was weird to go back a shoot scenes for a film that had been done for a while. They even talk about the special effects which gives us a great view from the actor's perspective. Everyone has fond memories about the shoot. 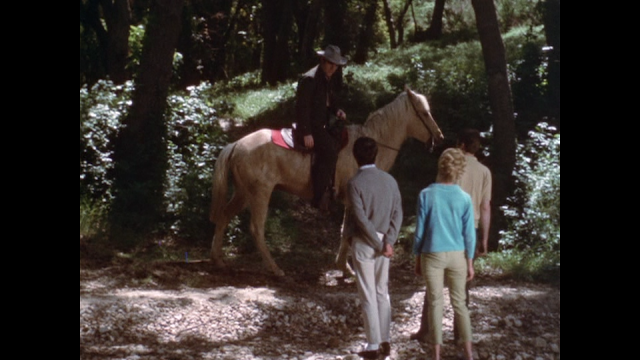 Here we have a silent short from 1972 and features many key Equinox talent. 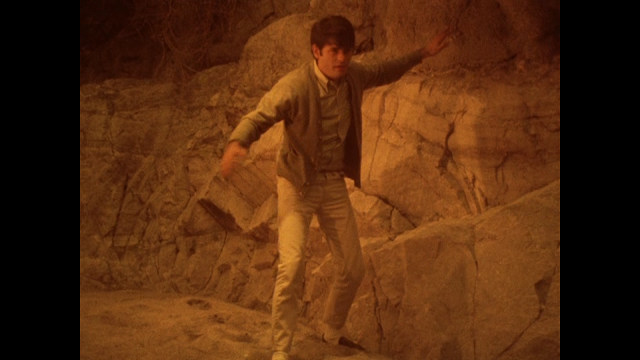 The film is about friends who go to a secluded place who are attacked by a monster who protects gold found inside a cave. The film moves at a good pace and I found it to be fairly entertaining. correctly then they get to open the box and get the treasure. end, but the journey was worth it. -"One From the Heart: Recollections of the Magic Treasure"
This is a text based featurette that goes through the making of the short. people to buy. This commercial features King Kong in all of his stop motion goodness. The following features are part of an overall photo gallery that is mixed with some information about a few of the photos. 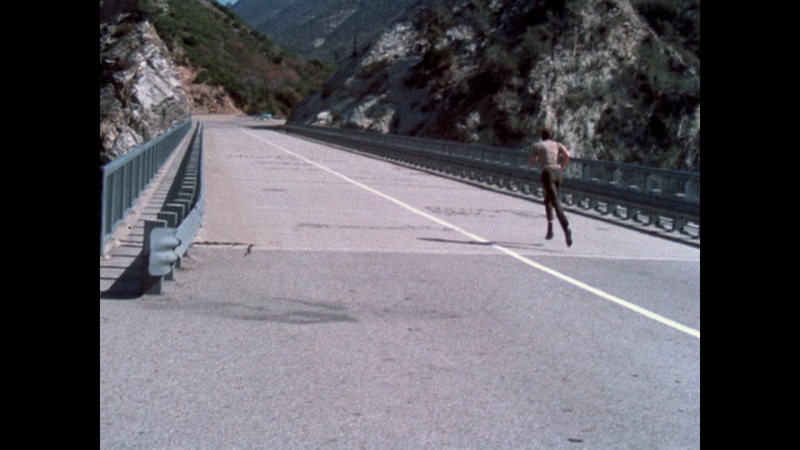 This trailer and tv spots were created for the theatrical release of the 1970 version of the film. As with all of the dvds that the have been released through the Criterion Collection, this come with a booklet, full color and gorgeous that begins with chapter selections for both versions of the film. We then get cast and crew listings for both versions of the film. George Lucas and Ray Harryhausen both off up their own stories of meeting Dennis Muren and seeing Equinox...The Journey into the Supernatural. The main essay is written by Brock DeShane who is a writer, actor, and director who has a passion of monster movies. Finally, we get information about the film transfer used for this dvd and the soundtrack used for the dvd as well. The front cover is striking. It features the first monster for see (in full) and some of the actors running from it all in a comic book like setting. The back cover gives us the description of the film, all the special features on both discs, and tech specs. Both discs feature some of the artwork used for the front cover. Everything comes housed inside of a double wide dvd case with no slipcover. 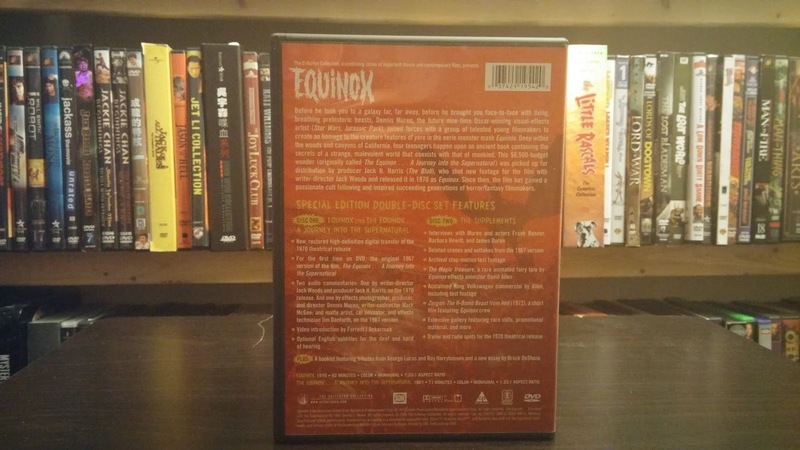 Both versions of Equinox are presented in their original aspect ratio of 1.33:1. 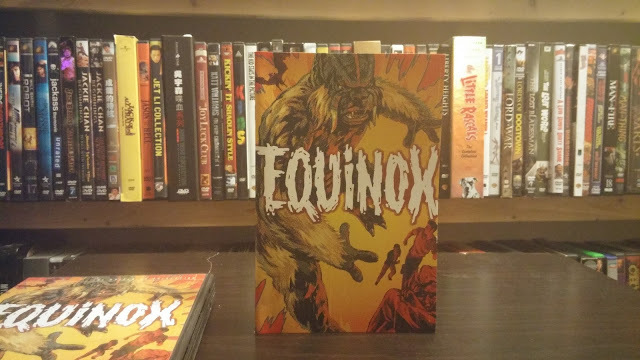 Equinox...The Journey into the Supernatural looks a bit rough. Lines, specs of dirt, scratches, etc are present throughout the film, but they add to viewing experience instead of detracting from it. Sure, a cleaned up picture would have been optimal, but what we have is the best we can get (at the time) and I can't fault Criterion for not trying harder to clean the print up. Nowadays, they'd be able to do, but even ten years ago it just wasn't possible. Equinox looks a bit better, but not by much. The Dolby Digital 1.0 track here is pretty good if a bit hissy at times. This comes through mostly in the interview segments, but it can be heard elsewhere as well. The film was dubbed later so the mouths don't match up with the lips, but that is how the film is, not a mistake made by Criterion. Outside of these observations, I didn't find anything wrong with the track. 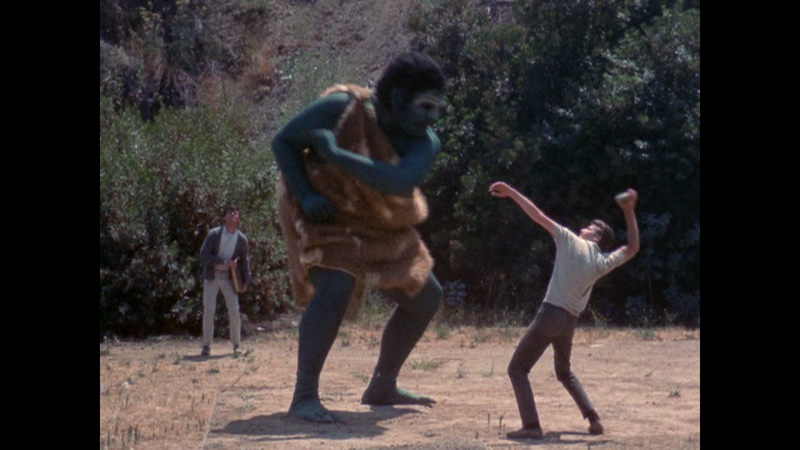 Equinox...The Journey into the Supernatural is a film that was made in 1967 by Dennis Muren (who would go onto win many Oscars as the head of ILM) with help from his friends who included David Allen and Jim Danforth who worked on the amazing stop motion sequences. 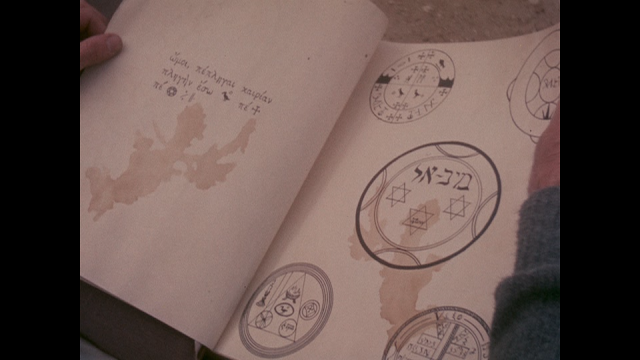 The film is a fun time as we watch these twenty-somethings go to talk to a professor that they know, get handed a book that contains secrets of a world that is much different than ours, and get attacked by all different types of monsters. The story doesn't matter much here as the attraction to this film would be the effects sequences. The filmmakers clearly love stop motion animation and they put on a great show with it. 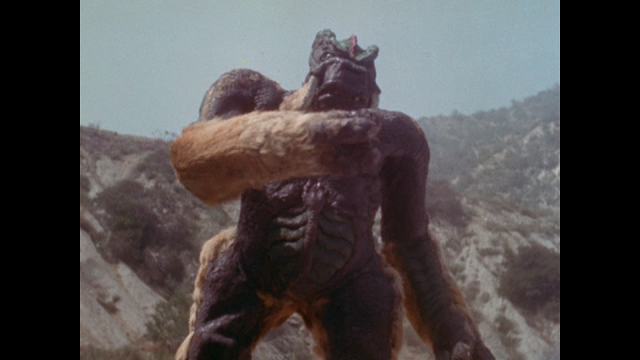 There is a giant monster that rampages through the plains looking for and trying to kill those who have the book. 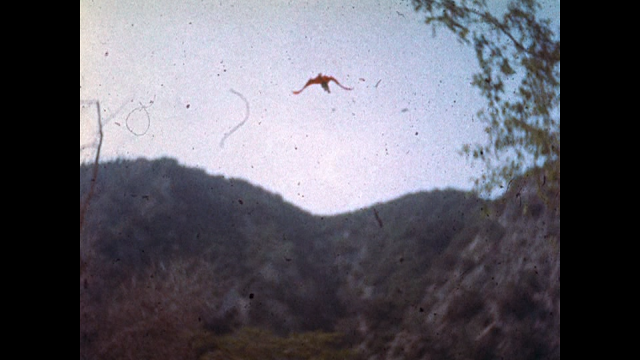 We also get a flying demon and a big monster that was achieved through clever camera placement. Sure, these effects are rough around the edges, but that is part of the charm of the film. This is a film that was made by people who love movies and no amount of bad acting (which there is quite a bit of) or rough looking effects can make us turn away from the film. 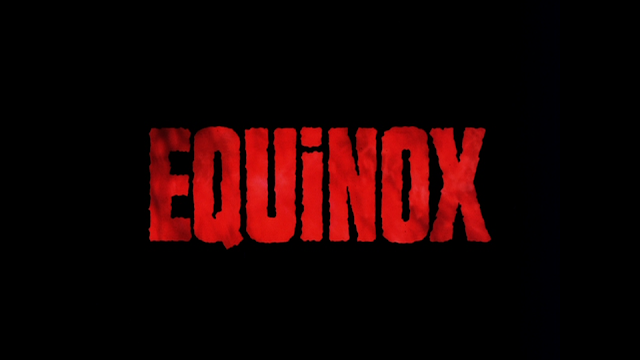 Equinox...The Journey into the Supernatural was bought up by Jack H. Harris Enterprises in the late 60's. 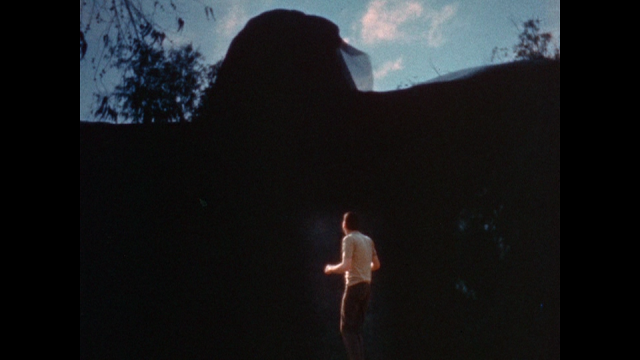 Harris then hired Jack Woods to write and shoot additional scenes to bring up the run time of the film and make it more appealing to audiences. 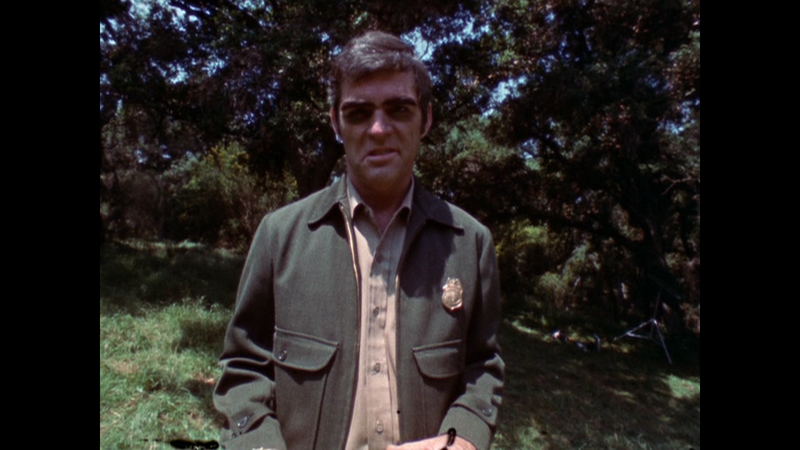 Harris had done this before with student films, with the most famous of these films being the Dan O'Bannon and John Carpenter cult classic Dark Star. The film was then release theatrically in 1970 and then later on home video by Wizard Video. The theatrical version of Equinox is a lesser film than the 1967 version. All of the additional scenes are not needed and just feel like filler. There is a scene that was added were one of the girls is raped (or almost raped) by the cop and you wonder why this needed to be added to a film that had nothing of that sort to begin with. The 1967 film is the version to watch. It is nice to be able to have both versions (which I champion on any release that has more than one version) to be able to compare the two versions, but at the end of the day, the 1967 version is the better version of the film. The added scenes break the flow of the film and add nothing but head scratching scenes to the film. 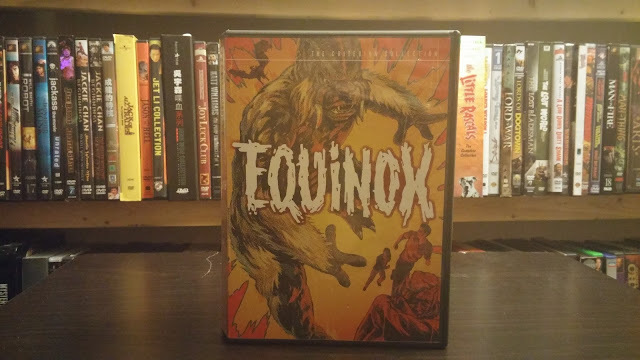 Equinox...The Journey into the Supernatural isn't a perfect film, but it is an immensely entertaining film with some great stop motion animation and effects work. Dennis Muren and company knew what they were doing and show a real grasp of the animation language. The film moves at a breakneck pace and is over before you know it. 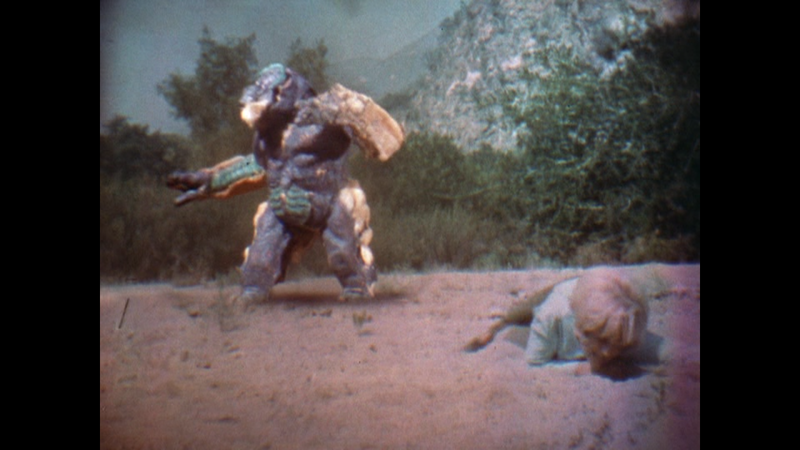 The theatrical version of Equinox bogs the film down with useless subplots and a boring villain. Watch the '67 version and leave the '70 version alone. Both versions of Equinox have their strengths and the weaknesses. They both suffer from weak stories and stilted acting. Equinox fares the worst because it has all of those added scenes of nonsense that, not only add to the film's run time, but make the film feel much longer than it actually is. 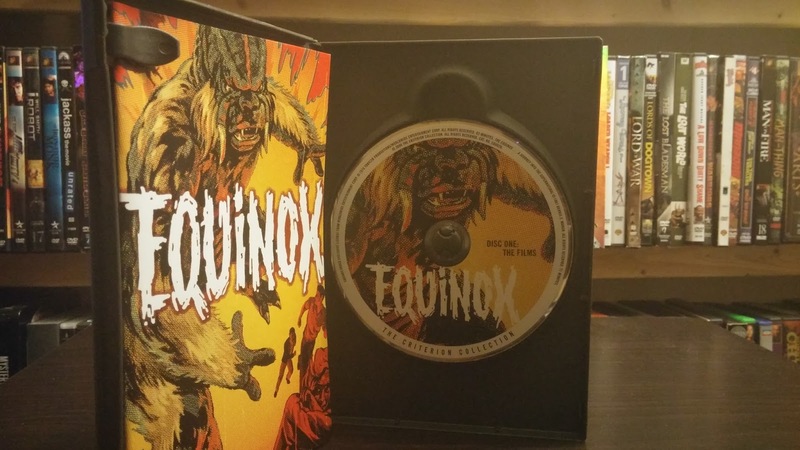 Equinox...The Journey into the Supernatural was made by fans of monster movies who wanted to make their own and they succeeded. 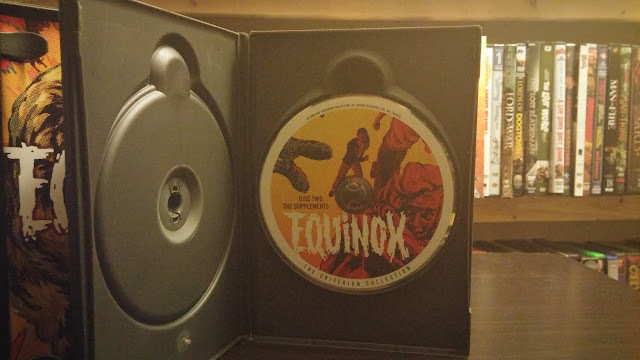 Equinox takes that footage, reedits it, adds new scenes that are not needed that were shot by people who just wanted to make money, and take away the heart of the film. The '67 version is the way to go. The dvd from Criterion is amazing. The commentary tracks are great. The featurettes are wonderful. The short films and everything else on these discs are worth the time. This is one of my favorite dvds in my collection. MORE SCREENSHOTS ARE ON THE NEXT PAGE. WARNING!! THEY MAY CONTAIN SPOILERS! !